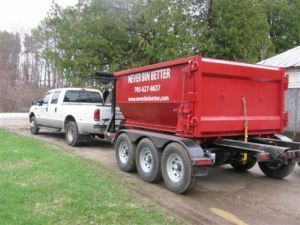 Daily, weekly, or monthly disposal container rentals perfect for removal of renovation, demolition, roofing or re-modeling debris, construction site clean up, scrap processing, general recycling. 10 and 14 yard bins available - call for a bin quote! "Thank you so much Patty for your quick response on this. I am very pleased with your services and trust me I will continue to use them for any needs that I require."